25 inch White Coral Necklace without Clasp. Threaded on a strong cord with calibrated 10mm beads. This necklace is long enough to easily slip over the average adult head. As you know from the red coral necklace story, red coral (corallium rubrum) is a very special material in necklace form for increasing the metabolic rate while unbleached naturally carbonated white coral is good for meditation and sought after for its calming influence. White coral is also strengthening to the metabolism but without the heating vibration of the red color. 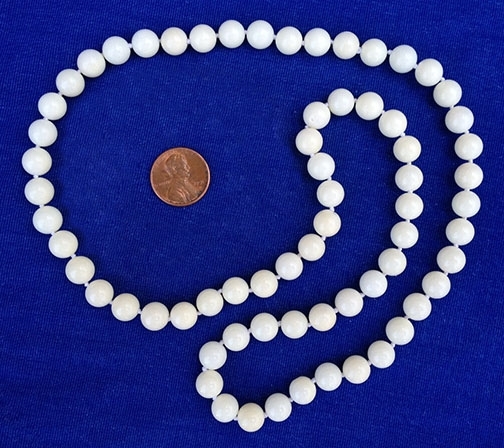 The rarer white carbonated coral used for expensive jewelry often comes from depths of 400 to 1200 feet and are not generally found in the shallow reefs of the world.